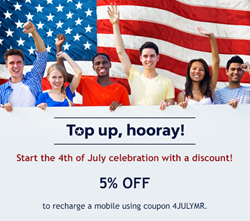 KeepCalling.com celebrates Independence Day with a special offer: 5% off on any international Mobile Recharge. The offer is available only on July 4th. With over 300 operators from more than 100 countries, KeepCalling.com can satisfy every need in terms of international mobile recharge. Since America is busy getting ready for its favorite summer holiday, KeepCalling.com has prepared a refreshing offer. As a special Independence Day gift, KeepCalling.com offers all its customers a 5% discount on any international top up. In order to take advantage of this promotion, customers need to place a Mobile Recharge order of any amount and use coupon code 4JULYMR in the ordering process on July 4th. With over 300 operators from more than 100 countries, KeepCalling.com can satisfy every need in terms of international mobile recharge. The process of sending a top up is fast and secure and the credit reaches its destination instantly. Customers need to select the country and the operator of the number they wish to recharge and then enter the mobile number. The destination number will be automatically saved, so in the future customers don’t need to enter it, as they can select it from their Mobile Recharge history. They also have the option to add a name to the number, so it’s easier for them to spot the person they want to send the top up to. After entering the amount, customers proceed to the checkout page, where they see the exact amount that will be sent and the amount they will be charged. There are no hidden fees. The entire process takes less than one minute, so sending a mobile recharge with KeepCalling.com is the most convenient solution. Customers are happy both with the quality and with the prices offered by KeepCalling.com. On Trustpilot, a famous review site, KeepCalling.com receives constant feedback from its customers and currently has an 8.6 rating out of 1100 reviews. One customer writes, ’Excellent service. I have been using this service for 3 years, have never had any problems, very dependable. No hidden fees, minutes never expire over time. Website easy to understand, easy to reload minutes’.